It used to be next to impossible to commute to work without a car, but today there are so many options that some people get by without even owning a vehicle. Want to learn more about alternative methods of commuting? We've put together some valuable information to answer many of your questions and put you on the road to getting off the road! Automobiles use significant amounts of natural resources and contribute heavily to pollution. Use this carbon footprint calculator to see the volume of greenhouse gases your car emits into the atmosphere. Maintaining a car is hard on your budget. Each mile adds more to the total, and sometimes you have to consider parking fees and toll roads as well. Enter the data in this commute cost calendar to get a monthly estimate. If you can bypass motor vehicles completely and use foot power by walking or biking, your weight and muscle tone will reap the benefits. Public transportation has grown beyond buses to include rapid transit, light rail, commuter trains and ferries. Now that suburbs and other outlying areas have become major residential areas, many public transportation systems have expanded their reach. Carpooling is a nice way to share the commute with others and get some company along the way. Some communities have vanpool programs where the vehicle is provided by an employer or the local transit authority. 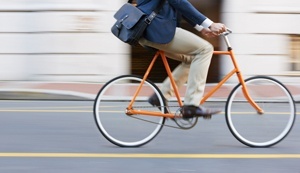 On a nice day, you can't beat biking to work for saving the environment while getting your daily exercise. Tip: Keep a well-stocked grooming kit at the office to freshen up. Uber is an accessible and relatively inexpensive option. You may not want to use it every day, but leaving the driving to Uber occasionally will still help. Many companies have begun implementing programs, such as paid bus passes or cash reimbursement, to encourage employees to use alternate means of transportation. If your company is not one of them, talk to your boss about starting a plan. Don't own a bicycle? Bike-sharing programs are being adopted by more and more cities across the country. Create a network of people at your company who are interested in carpooling. Keep a database of names and locations that people can view to form their own groups. Why not start a carpool with other residents at our Springs luxury apartment communities? It's the perfect way to save money while getting to know your neighbors! Talk to a member of our onsite management team if you have any questions.